Tokyo, December 5, 2014 – Fuji Heavy Industries Ltd. (FHI), the manufacturer of Subaru automobiles, today announced that its all-new Outback (EyeSight *1-equipped European specs.) 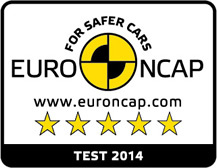 has won the highest five-star overall rating in the 2014 European New Car Assessment Programme (Euro NCAP) *2 safety performance test. The Euro NCAP evaluates "Adult Occupant Protection", "Child Occupant Protection", "Pedestrian Protection" and "Safety Assist". In its renewed 2014 safety performance assessment system, point allocation of "Safety Assist" performance test has been increased. In addition to "Occupant and Pedestrian Protection" performance, the all-new Outback's "Safety Assist" performance was rated as good by employing the EyeSight . 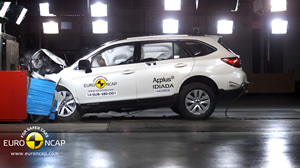 This is the fourth time that Subaru was honored with the prestigious five star rating from Euro NCAP following the 2009 rating for the Legacy, 2011 rating for the Subaru XV and 2012 rating for the Forester. *1: EyeSight(ver.3) as it is known on the Japanese market.